^ a b c d "Gorgon EIS 2009-Response to Submissions" (PDF). Chevron Australia. Retrieved 20 August 2009. 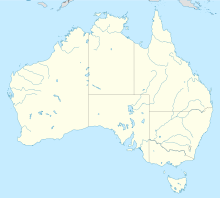 ^ "Gorgon, Northern Carnarvon Basin". Offshore-technology.com. SPG Media Limited. Retrieved 16 June 2008. ^ "Chevron gets Gorgon green light". Upstream Online. NHST Media Group. 7 September 2007. (subscription required). Retrieved 18 July 2008. ^ "Chevron gets Gorgon green light". Upstream Online. NHST Media Group. 27 October 2007. (subscription required). Retrieved 18 July 2008. ^ "Gorgon Expansion" (PDF). Federal Minister for the Environment, Heritage and the Arts. Retrieved 26 August 2009. ^ "Gorgon To Drive Australian LNG Asia-Export Surge" (PDF). JPT. November 2010. Retrieved 2 June 2011. ^ "Project Overview" (PDF). Chevron Australia. Retrieved 20 August 2009. ^ Milne, Peter (19 December 2017). "Carbon hiccup for Chevron with 5 million-tonne greenhouse gas problem at Gorgon LNG plant". The West Australian. Retrieved 23 January 2018. ^ "Shell inks Gorgon LNG deal with PetroChina". Sydney Morning Herald. 4 September 2007. Retrieved 27 August 2009. ^ a b "Gorgon-Revised Public Environmental Review" (PDF). Chevron Australia. Retrieved 20 August 2009. ^ "Domestic Gas" (PDF). Chevron Australia. Retrieved 20 August 2009. ^ "Project Newsletter Oct08" (PDF). Chevron Australia. Retrieved 29 August 2009. ^ "Barrow pipeline adds to protesters woes". Upstream Online. NHST Media Group. 11 December 2007. (subscription required). Retrieved 18 July 2008. ^ "Gorgon gas project 'environmental vandalism'". Australian Broadcasting Corporation. Retrieved 27 August 2009.